The African wild dog, or painted dog, is a fierce predator found in the open plains to dense forests of sub-Saharan Africa. The Latin name, Lycaon pictus, means "painted wolf" and refers to the animal's mottled coat. 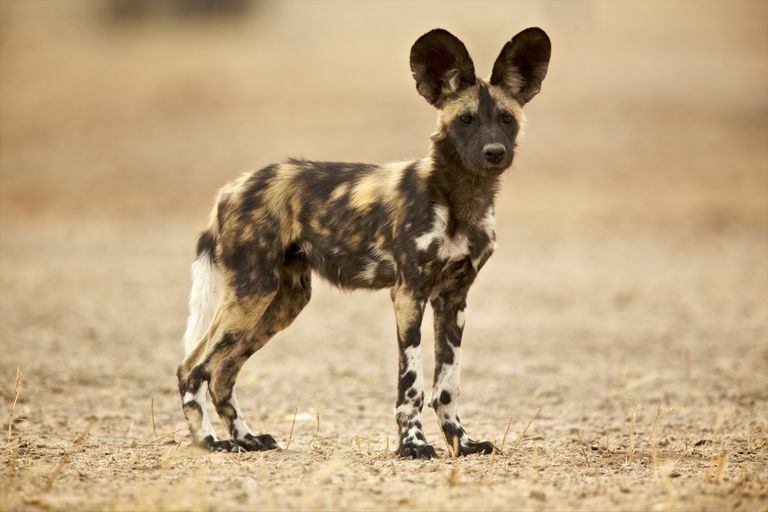 African wild dogs may be mostly solid-colored or painted with patches of black, brown, red, yellow, and white. Each dog has its own unique pattern, although most have a white-tipped tail that helps members of the pack find each other during a hunt. They are long-legged animals with large, rounded ears. Some characteristics of the African wild dog set it apart from other canines. Although tall, it is the bulkiest African canine. The average dog weighs 44 to 55 pounds in East Africa and 54 to 72 pounds in southern Africa. It stands about 24 to 30 inches from the shoulder, with a 28 to 44 inch body length and 11 to 16 inch tail. Females are slightly smaller than males. The species lacks dewclaws and usually has fused middle toe pads. Its curved, blade-like lower teeth are unusual, only seen in the South American bush dog and Asian dhole. African wild dogs have different fur from other canids. The coat consists entirely of stiff bristles that the animal loses as it ages. There is no underfur. While body marking is unique to each dog, most have a black muzzle with a black line running up the forehead. Although wild dogs communicate vocally, they lack the facial expressions and body language seen in other canids. While the African wild dog once roamed the mountains and deserts of most of sub-Saharan Africa, its modern range is restricted to Southern Africa and southern East Africa. Groups tend to be isolated from one another. The African wild dog is a hypercarnivore, which means its diet consists of over 70 percent meat. Packs prefer to hunt antelope, but will also take wildebeest, warthogs, rodents, and birds. The hunting strategy depends on the prey. The pack hunts antelope by sneaking up on the herd and then running down an individual, repeatedly biting it on the legs and belly until it weakens. The wild dog can give chase for 10 to 60 minutes, running at a speed of up to 66 kilometers per hour. L. pictus has a very high hunting success rate, with 60 to 90 percent of chases resulting in a kill. The only significant predator of the African wild dog is the lion. Spotted hyenas commonly steal L. pictus kills, but tend not to hunt the dogs. Wild dogs "sneeze" to vote on pack decisions. The sneeze is a sharp exhalation through the nostrils that signals assent or agreement. When a pack gathers and the dominant mating pair sneeze, departure for hunting is likely. If a less dominant dog sneezes, hunting may occur if enough members of the group also sneeze. African wild dogs form strong social bonds and are found in permanent packs of adults and yearling pups. The average pack has between 4 and 9 adults, but much larger packs occur. The dominant female is usually the oldest one, while the dominant male may be either the oldest or strongest. Typically, only the dominant pair breeds. Usually, only one litter per year is born. In Southern Africa, the dogs breed in April to July, but there is no fixed breeding season in the East African packs. Mating is brief (less than one minute). Gestation is 69 to 73 days. The African wild dog has between 6 and 26 pups, which is the largest litter of any canid. The mother stays with the pups and drives away other pack members until the pups can eat solid food (3 to 4 weeks of age). Pups get to eat first once they start hunting, but lose priority once they are a year old. Once they are sexually mature, females leave the pack. The average life span of a wild dog is 11 years of age. At one time, African wild dogs roamed all of sub-Saharan Africa except the driest parts of the desert and the lowland forests. Now, most of the remaining dogs live in southern East Africa and Southern Africa. Only 1400 adults remain, divided into 39 subpopulations. 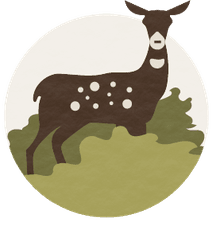 The species is categorized as endangered because the packs are widely separated from each other and numbers continue to decline from disease, habitat destruction, and conflict with humans. African wild dogs cannot be domesticated, although there are instances in which they have been kept as pets. McNutt; et al. " Lycaon pictus ". IUCN Red List of Threatened Species. Version 2008. International Union for Conservation of Nature, 2008.